« What is the Perfect Class Size? Should Parents Ban Smartphones from Their Kids’ Room at Night? For the study, researchers from the Wales Institute of Social and Economic Research Data asked more than 800 12- to 15-year-olds about their sleep habits — including how often they woke up at night to use social media. Researchers also asked about the teens’ levels of energy and well-being. What did the researchers find? Waking up at night to use social networking platforms like Snapchat and Instagram was surprisingly common. Twenty-two percent of 12- and 13-year-olds and 23 percent of 14- and 15-year-olds said they “almost always” did so. More than a third said they did at least once a week. This behavior seems to take a real toll. More than half of the heavier nighttime social media users said they usually go to school feeling tired. “In turn, we find a significant association between feeling tired when they go to school and their overall levels of subjective well-being,” Dr. Chris Taylor, a researcher at Cardiff and one of the study’s authors, added in an email to The Huffington Post. For some teens, this combination could contribute to mental health issues. Heavy social media use and poor sleep have both been found to take a toll on young peoples’ mental health, so the combination could be even more problematic. So what’s the solution? Pushing back school start times probably isn’t the answer, as the study’s authors argue that more time to sleep in the morning doesn’t compensate for sleep disruptions. Structured morning routines can be helpful for mediating the effects of poor sleep, the researchers explain, so disrupting those routines with later school start times may not be beneficial. 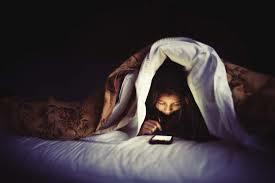 Instead, the study suggests that it may be more effective to discourage teens from using technology at night. One way to do it? Keeping digital devices out of the bedroom so that a good night’s sleep won’t ruined by the lure of Twitter. This entry was posted on September 23, 2015 at 9:53 pm and is filed under Parenting. You can follow any responses to this entry through the RSS 2.0 feed. You can leave a response, or trackback from your own site.